Surveillance video showed the gunman, who was not identified, trying unsuccessfully to enter the school, authorities said. School officials’ swift decision to lock the doors after hearing gunfire was “monumental” in saving the lives of countless children, Johnston said. No one was killed there. The shooter stole the car of a person who stopped to check on the crash and ran away when confronted with a gun. He continued the rampage until police shot him about 45 minutes after it started, Johnston said. Police offered no immediate word on the assailant’s motive, but a sheriff’s official said the shooter’s neighbors had reported a domestic violence incident a day earlier. Officials did not specify who was involved or what happened. Salvador Tello said the gunman fired at a truck in front of him as he went to drop off his three children at school. Tello said he was about three blocks from the school when bullets made “big holes” in the truck. 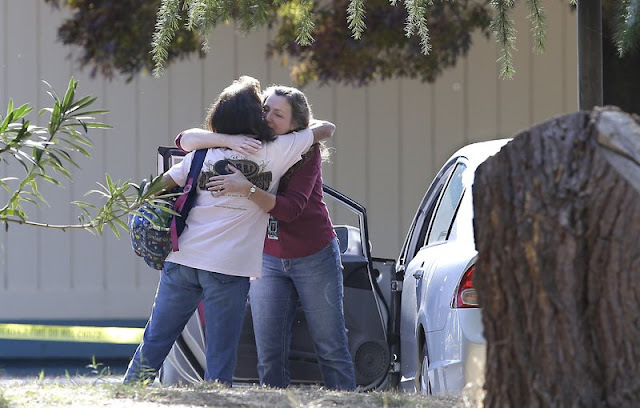 0 Response to "Gunman targets people at random in California town, kills 4"